The Fire TV Stick is the best-selling streaming media device Amazon has ever made. That’s saying a whole lot, of course, because Amazon’s Fire TV line is one of its most successful product lines ever. Amazon recently added a bunch of new devices to its Fire TV lineup, including some exciting ones like the $120 Fire TV Cube, currently on sale for just $59.99, which basically is a combination of a Fire TV and an Echo speaker. 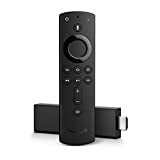 But the biggest addition to the company’s lineup has to be the hot new Fire TV Stick 4K with all-new Alexa Voice Remote, which takes everything great about the Fire TV Stick and adds more power, 4K resolution, HDR, and a new version of Amazon’s Alexa remote that includes universal remote buttons to control your TV. This new model instantly because a best-seller for Amazon at $50, but nothing is full price on Cyber Monday. In fact, Amazon is actually running a better deal on the new Fire TV Stick today than it did for Black Friday! You can snag one Fire TV Stick 4K today for $34.99, which is $5 less than the normal selling price of the previous-generation Fire TV Stick. But if you buy two instead of one, the price drops to just $29.99 each! That’s $10 less than the Fire TV Stick’s $40 retail price, and it’s one of the best bargains you’ll find on Cyber Monday 2018.